The new Planet of the Apes movie looks tense! You could also put those slides from 'What Are The Kargrandes?' in a Slideshare for LinkedIn, since you have them in that format, anyway. It doesn't take very long. I wanted to see Dream Theater when they toured near here to get the experience, but it didn't work out. I saw Alice Cooper in concert and his shows are a production and one to experience. I was lucky to meet him after the show a real nice guy! Also, I saw the Trans Siberian Orchestra and it was amazing! That is a production that seduces all your senses. Truly amazing and you will def be in for a holiday treat! Haha Lake Placid I do remember that movie. Have you ever been to Lake Placid? It is very beautiful there. You sure did pack a lot into your post! I will check out the videos later. Love the Trans Siberian Orchestra music. Definitely says Christmas. Both movie trailers look interesting. I remember Lake Placid. 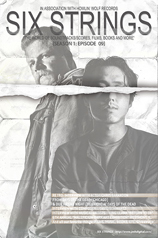 Loved the way it ended. Betty White was a card in it. The TSO music is really nice. The local so-called oldies station (which has been mostly doing post-1975 music for a long time now) switches over to 24/7 Christmas music earlier and earlier every year, sometimes right after Halloween. It's kind of hard to really appreciate Christmas music when it's being played around the clock for almost two months, instead of only starting a few weeks in advance. I'm not sure I'll watch War of the Planet of the Apes. I'm more into the "let's find a way to live together" kind of person, and I remember how the original series ended. I even read the book the movies were based on. It didn't end well for the humans. Love the TSO video. We got to see their Christmas concert live a few years ago. They have such a flair for the dramatic. And talk about grand! Adding the the power metal elements was really fun too. Thanks for the Deja Vu shout-out Alex! The Apes movies are always a hit with me. Still, like many things, I'm old school and like the originals, but these recent ones are well done. Thanks for the TS Orchestra music. Timeless as ever. I enjoyed both movie trailers. Planet of the Apes just isn't the same w/o Roddy McDowall. I especially enjoyed the Christmas music and the powerful video utilizing historic film clips. The little girl and kitten were precious. Thanks, good buddy Alex, and have a great week! Making a performance more like a production would keep it interesting. Planet of the apes I'll watch eventually. Spiderman looks good, hopefully they'll get it right on the 3rd time around. Elizabeth, if I join that site, I will. Truedessa, meeting Cooper is cool. I've seen TSO before and will see them again this week. Never been to Lake Placid though. Sandra, I think that qualifies as a production. And a half! Mason, Betty White was awesome in that movie. Donna, they put on an amazing show. DL, you're welcome and bummer. It's always great to have you visit, Alex! Thanks for the shout out. Thanks also for the info and links. Have a great week! That's super great that you had so much fun and a little funny that people were sneaking shots at the end. Happy Monday and boogie boogie. Your concert sounds like it was amazing. Glad you will be able to relive it on DVD. I recently heard from someone how awesome the Trans Siberian Orchestra is live- so this was a nice treat. Sounds like a great concert! Thanks for the Trans Siberian Orchestra carol-I love their music. Can't say I'm excited about the Ape movie. For some reason, I never could get into those. Have a great week! I hadn't heard about the new Apes movie! Is it supposed to pick up after the last one? Alex, great to see you on the dance floor with the 4M crew. Yep, I'm temporarily co-hosting with Marie again. She's short-handed so I offered to help out for as long as she needs me. I really like Transatlantic Orchestra. Every time I hear 'Christmas Eve' I always think of the movie Home Alone. That's such a fun flick! Great movie clips! War of the Planet of Apes looks good but I'm not sure if I like enough to actually pay to see it. The apes look so realistic, especially compared to the originals from the 70s with Roddy McDowall. Now, Super-Man: Homecoming looks AWESOME! That one has the potential of being a blockbuster! I would pay to see this one. :) Devin Townsend Project is a just a bit too hard rock to suit my general listening pleasures. They are fantastic musicians, though. Thank you for the intro. Have an amazing week, my friend! Short on the concert as none in our region. War of the Planets of the Apes ought to be given attention. Just how different with the earlier ones. 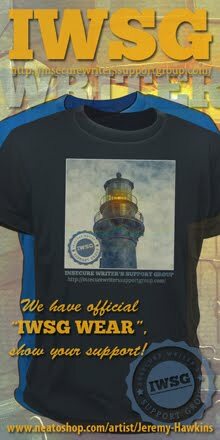 Will take a look at the the IWSG with its new host! I need to get caught up on the Planet of the Apes movies, but first I'm doing the Star Wars prequels that ran on TNT last weekend. I'm just as far behind in my movie-watching as I am in my book-reading. thank you for all ya' do and the shout out! The new Apes movie looks so intense. 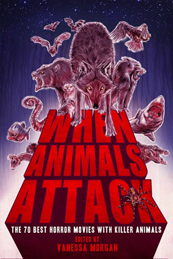 Congrats on When Animals Attack. Great new releases. I'm excited for Rogue One. We've got tickets for Friday, when the kids break up from school and college. Enjoyed the Trans Siberian Orchestra video! It would be so cool to play with them! Ivy, everyone got out their phone. What were they going to do - throw us out at the end of the concert? Jess, you need to go see them. Cathy, good of you to help her! I visit you shortly. glad you got to see your fave group. I"m sure they appreciate a lifelong fan. Sounds like quite a production. I've never been a big TSO fan. I listened to some old Christmas classics this weekend and baked. Yum....I'll offer you a mini-pecan pie. They are quite tasty. Congrats on all the new releases. Interesting ideas for anthologies. Of course, I have to give a shout-out to my CP, Carrie. She outdid herself on this one. My mouth is still hanging open over her trailer. It always takes me so long to watch movies. I still haven't see Dawn of the Planet of the Apes. Memememe! I'm excited for the Planet of the Apes. I've enjoyed the Planet of the Apes remakes and will no doubt see this new one when it arrives at the theaters. Despite all the recent crappola, I do feel the Christmas Spirit and this is always a rockin style for me. The new ape movie looks excellent but, like Shady, I love Roddy in the originals. I haven't seen the new Spider-Man series because it just seems to be too new from when Tobey McGuire played him but this does look enjoyable. 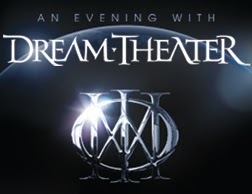 The Dream Theater show sounds excellent--one that I'd probably have enjoyed immensely. I was very impressed a few years ago when I saw Spock's Beard perform near me in a concert that was film and eventually released on their live CD/DVD. It's so cool to watch that DVD now and know that I was in that audience along with Larry Cavanaugh who drove from Phoenix to see the show. I've seen several concerts that were productions to a large extent, but it's been years ago. Kiss, Jethro Tull, Alice Cooper, and Todd Rundgren and the Hello People particularly stand out in my memory. A great show along with great music makes a concert extra special. I will make it to see this new Planet of the Apes, but it does seem darker than the others. Congrats to Carrie. I wish her the best. I'll stop by and say hello at Karen's. Have a great holiday season, Alex. The Spider-Man trailer reminds me of Marvel Team-Up. I suppose I would need to begin at the beginning with the planet of the apes movies. Thanks for the music also! Happy holidays, Alex. Wishing you all the best for the coming year! Wow! That concert sounded fantastic. I liked Tobey Maguire, but they nailed it with this Spiderman. The TSO music and video are great! Joanne, I would eat that. Birgit, this is now the third series - and hopefully the last for a while. Al, he is all sorts of geeky fun! I enjoyed the Sarajevo video even more than the music. Nice find, Alex. Congratulations to all the authors who keep getting their books into the literary world. Can't wait for the next Planet of the Apes movie. It's another movie I'm looking forward to in 2017 besides The Wall, Wonder Woman and the Guardians of the Galaxy sequel. Not too sure about the new Spiderman though. The TSO clip was lovely. Proof that we have many more similarities than differences. Thank you - and as always, thanks to all writers. That kind of production sounds like a blast, because it was done right. The Justin Bieber kind that features a lot of lame, choreographed dancing and lip-syncing as a result of said dancing, however, does not. Also, Steve Vai was in the 1986 movie Crossroads, playing the devil's guitar player, so it doesn't surprise me one bit that Devon Townsend is a cenobite. I don't know about the Planet of The Apes series. It doesn't sound like there's a good outcome for anyone. Off to read your interview. The Planet of the Apes movies always ended so sad -- I get enough sadness for free -- though they are always well done. I've never been much of a concert person. I think it's because I'm way too visual. So I think I'd enjoy a concert that was more of a production. I need flashiness, I guess! I'm quite far behind on my 'to see list' at the movies! I quite fancy Planet of the Apes though. Nope, don't want to see another Planet of the Apes movie thanks. One was enough. Glad you got to see a show you really enjoyed. To those who haven't read Carrie's new book, it is a great story set around an earthquake. Scary stuff when you know it could happen. Have a great Christmas Alex as well as a wonderful New Year. Ah, the Deja Vu blogfest. May have to ponder that one. Hope you are well, Alex! I always listen to TSO to elevate the Christmas spirit. And Lake Placid is a classic at our house. Not excited for any more Ape movies. You know, I've never been to a concert (Apart from a Christian Music Festival). There sure is a lot going on, and I've never heard of most of it. I must get out more. Have a great week. I've got so many Spider-man books, you could say I'm sort of a Spider-man nut im expert. Can't wait to see that movie. Six is a charm, right? P.S. Check out your new hat. I saw the Spiderman trailer was out, but haven't watched it until now. Totally loled at Tony Stark and the hug part. Huge congrats to Carrie on her new book. I really need to go to a concert. Best I've been to was a little gospel concert I performed at back at high school. It was cool performing at a paid event like any other performer but still, not sure it counts. Though I believe it is a great experience for Drama Club members. Hope other schools take it on if they get the chance. No better way to know not to mess up on stage. Too bad I only got to be in Drama Club for a short time. Parents weren't Artsy people. Anyway love the Apes trailer and can't wait. Surprised I enjoyed this more than Marvel/Sony Spiderman trailer. The new Spidey trailer was great but this version of Peter Parker was underwhelming for me. I heard they took parts of Miles (black spiderman) backstory and used bots of Ultimate Spiderman. I know little to nothing about either of those versions. Vulture, Tony and suited Spidey moments were spot on though. Summer 2017 will be exciting. Lidy, we need to get you to some concerts. I've seen over a hundred. Elephant's Child, that's good to know! Brandon and Bryan, it fits, doesn't it? Roland, I agree they are rather depressing, but they are well done. Ellen, this is number three of the reboot. Stephanie, most of the concerts I see now have massive screens behind the band with images timed to the music. Marie, I'll have to go check it out! Glad you enjoyed this one. It's one of TSO's best. Sheena-kay, being a part of the concert is really exciting though. I certainly enjoy it. The Trans-Siberian O always puts me in a great mood - talk about talent!!! It's always great when you can see a band you're a big fan of. Glad the concert exceeded your expectations. Cute Trans Siberian Orchestra video--even with kittens! I'll be candid in saying I did NOT watch the Spiderman and Planet of the Apes trailers (Both movies I want to see...I like it better when I can enjoy them fresh without the trailers ruining everything ;) ) However I did love the Christmas Music. Thank you! Congrats on the new site! Mine is currently in progress, and it's nerve wracking as I wait for updates. I'm so excited to unveil it, though. The concert that was most like a production had to be Roger Waters from Pink Floyd, although Culture Club came close. I lost track of how many people were in that band, and Boy George was extraordinary, as always. Alex, I loved the music,loved the reviews and news. Thanking you for all the support you have given me throughout the past year. May you achieve your goals in the coming year. To you and the Missus, Merry Christmas and blessed holiday season. I'd love to see Dream Theater in concert. I may have to check out the DVD when they release it. Jemi, it would be awesome to play with them. Robert, I am here to entertain. JH, I imagine the Pink Floyd one was amazing. Hilary, he is indeed a character. Nila, sorry you couldn't see the kittens! LG, it will be amazing. 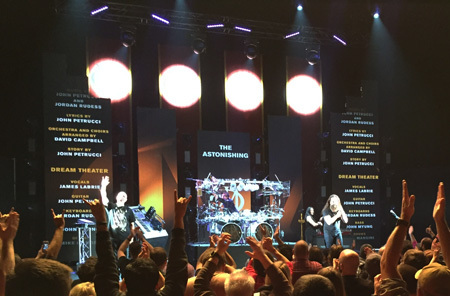 Wow, that Dream Theater in Concert sounds amazing! Lucky you! Thanks for the movie trailers! Merry Christmas! Sorry I'm so late stopping by, Alex--just can't seem to catch up these days with my own life! I'm definitely interested in Carrie Butler's book. I have relatives who live in the Northwest, and the nonfiction book Full Rip 9.0 scared the crap out of me. I now know what a subduction zone is and that a giant tsunami might be just around the corner. Carrie's book should really scare me! I saw the Who in concert a long time ago and have a vague memory that it was like a production, but it was the early 80s. I am excited about the next ape movie, but not excited about Lake Placid. The only problem with "War for the pLanet of the Apes" is that we know who wins. That's great you got to see the concert. It sounds amazing. I do love some TSO. Sounds like the concert was good, awe-inspiring. I don't think I've been to one like that before. The question isn't "Have you seen Lake Placid?" It is "How many times?" TSO always puts me in the Christmas mood. Thanks for sharing! Wishing you a very happy Christmas, Alex and thank you sooooo much for all your support this year. It's been a good one despite its curve balls. That's interesting that they're doing another Spiderman movie, with a little twisting. Glad you enjoyed your concert!! Aww, Christmas music and kittens - can't go wrong with that combo. I hope you have a very Merry Christmas, Alex! And that mini-Alex does as well. Enjoy the holidays. Spiderman looks like it has possibilities. Helena, as long as you want to be scared! Charles, yeah, we do know. Rosey, TSO's version is over twelve years old. At least. Hi Alex, your post is packed with good things as always, thanks for all the info. I adored Monday’s music (and the kittens). Best wishes to you and yours this Christmas. I cannot WAIT for the next Planet of the Apes movie! These remakes have been amazing. 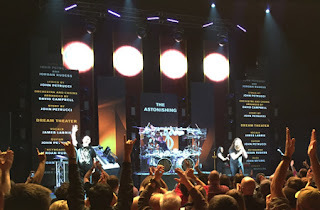 I've only heard a few songs by Dream Theater, but they've definitely got some serious skill and talent going there; I think I'd like them a lot more if I sat down and listened to an album or three. ^_^ That is very cool that you got to see a favorite band on the last night of a major concert tour. And I've never been a huge Spider-Man fan, but that new trailer has me seriously geeked for it. 2017 is going to be an amazing year for Marvel movies. Keith, they have been really high quality. Mason, as a musician, I just listen with awe... And it will be a geeky good year for Marvel movies. Will hop over to Karen's blog to read your interview now. Family issues have kept me so busy that I haven't visited any blogs from the past few days. Alex, nice interview at Karen's. Enjoyed reading it! Merry Christmas, everyone! Will catch up with all comments this coming weekend. Whaat! a new planet of the apes movie? Yes!!! I have seen Lake placid, lake placid two and lake placid three.Lake placid versus anaconda and lake placid the final chapter. Also Tremors 1-5 Would love another one though ( wink).